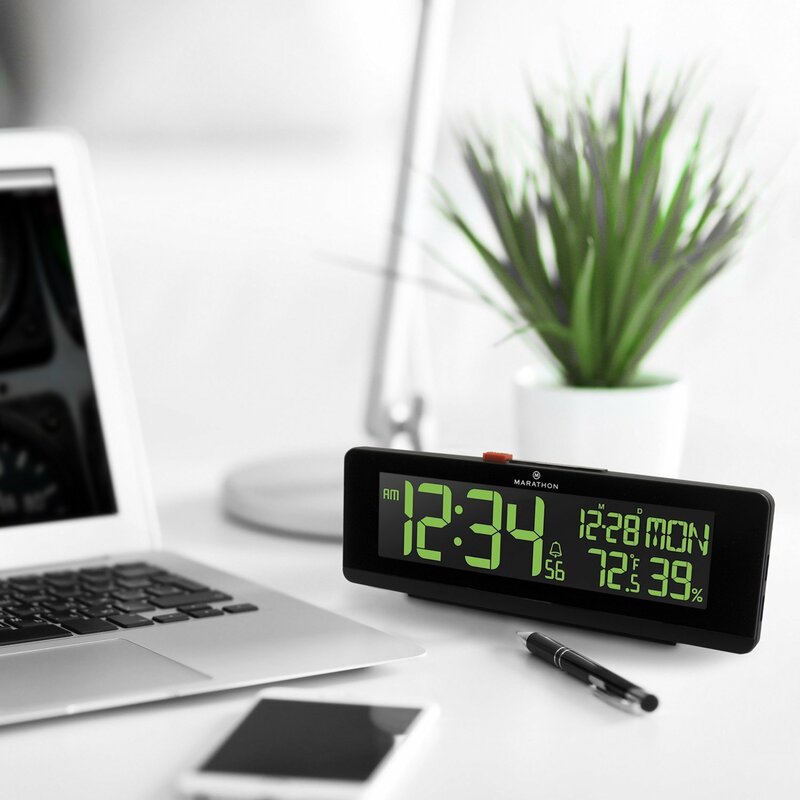 With a display of time, indoor temperature, as well as the day of the week, date and month, the COLOR ALARM CLOCK & USB CHARGING will certainly keep you informed of more than the time of day. 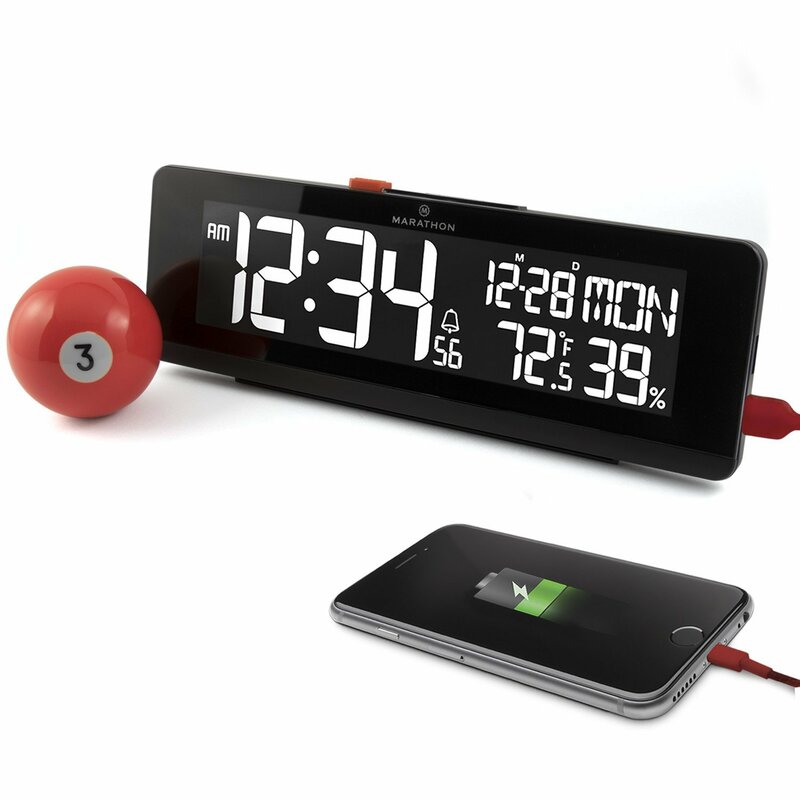 Includes an alarm and snooze button (5-minute intervals). And with the countdown display, it will be down to the wire! 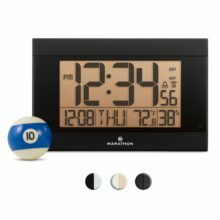 Marathon Watch Company’s new COLOR ALARM CLOCK & USB CHARGING has many features that make it an excellent addition to your nightstand or bedside table. The first thing that separates this clock from the rest, is the customizable 256 color full spectrum LED display. You can choose your favorite color or enable the auto-scroll feature, which will continuously transition through all available colors. Conveniently located on the side of the clock are two USB ports for charging your devices. 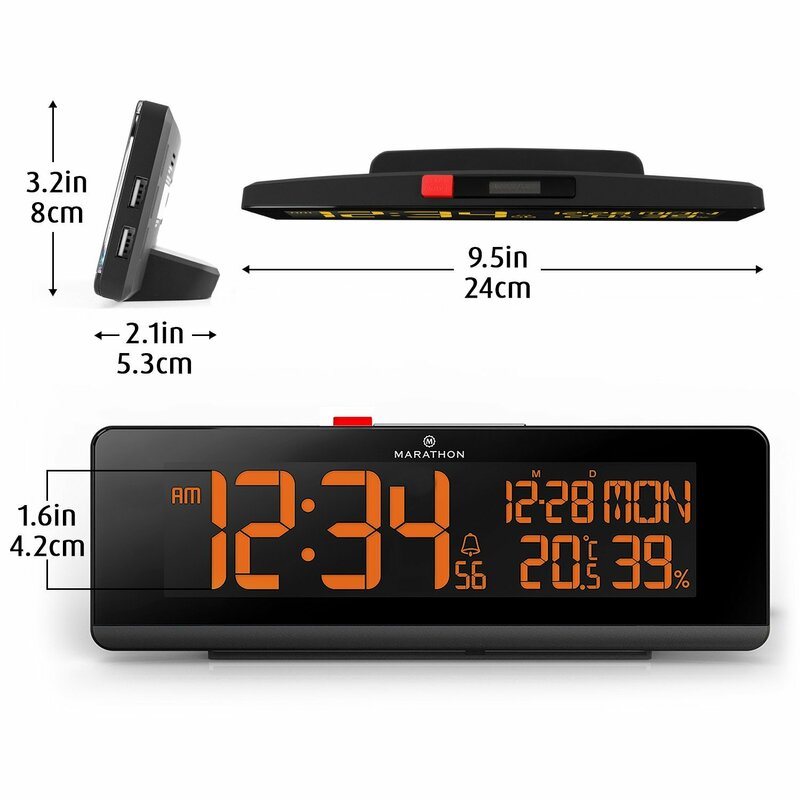 This unique alarm clock also features easily accessible alarm and snooze buttons, ideal for finding in the dark. 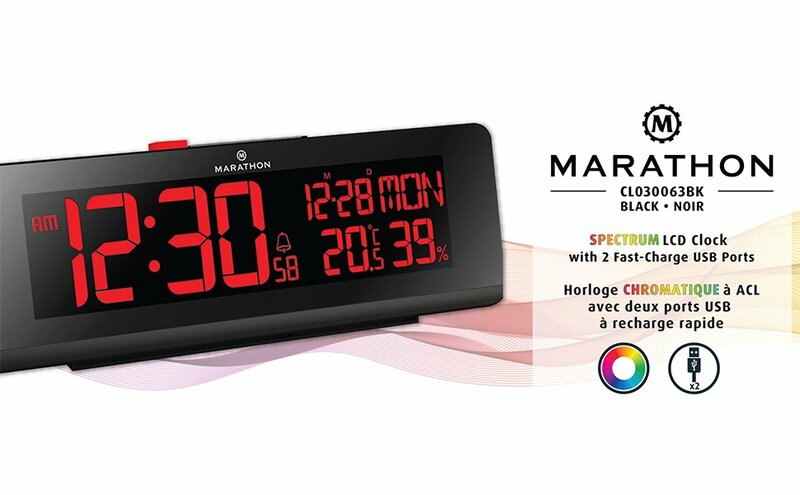 The large display allows you to easily see the time, date, the day of the week, temperature and humidity all at a glance. The time can be displayed in 12 or 24-hour format, the temperature in Celsius or Fahrenheit and the day of the week in 5 languages (English, French, German, Spanish and Italian). 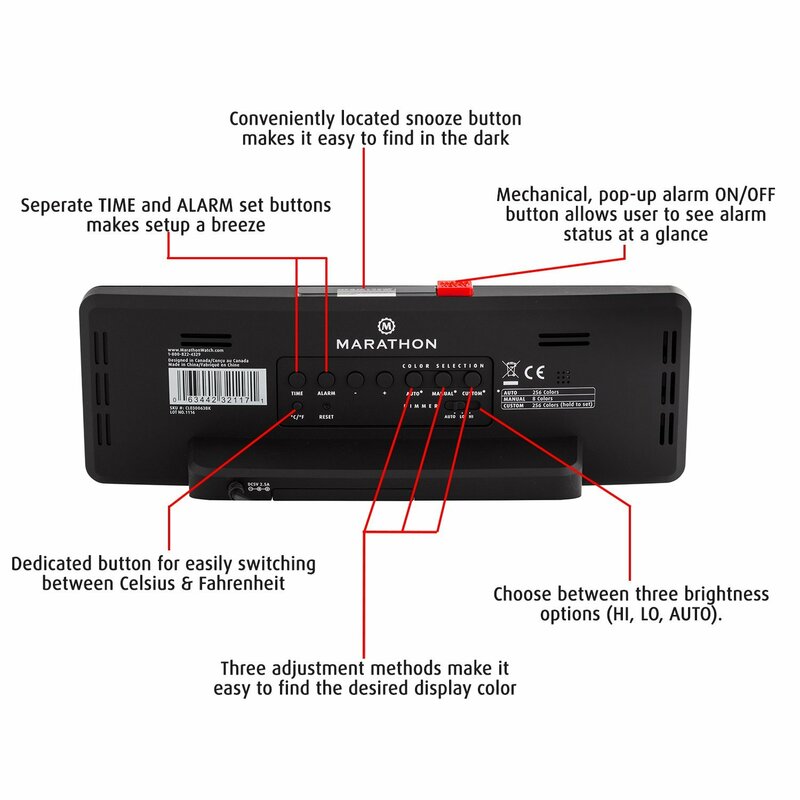 With backup battery power (batteries included) your alarm will sound even in a power outage. 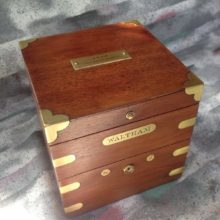 COLOR CHANGING DISPLAY: Customizable display has 256 colors to choose from with an auto-scroll feature. USB CHARGING: Dual fast charging, easily accessible USB ports. ALARM WITH SNOOZE: Easy to set alarm with snooze function (5-minute intervals). MULTIPLE DISPLAY MODES – 12 or 24-Hour display formats with indoor temperature in Celsius or Fahrenheit and day of the week in 5 languages. AC ADAPTER: 100V-240V Universal AC Adapter and battery backup for clock (3 x AAA included). Looking to grab and keep your child’s attention? 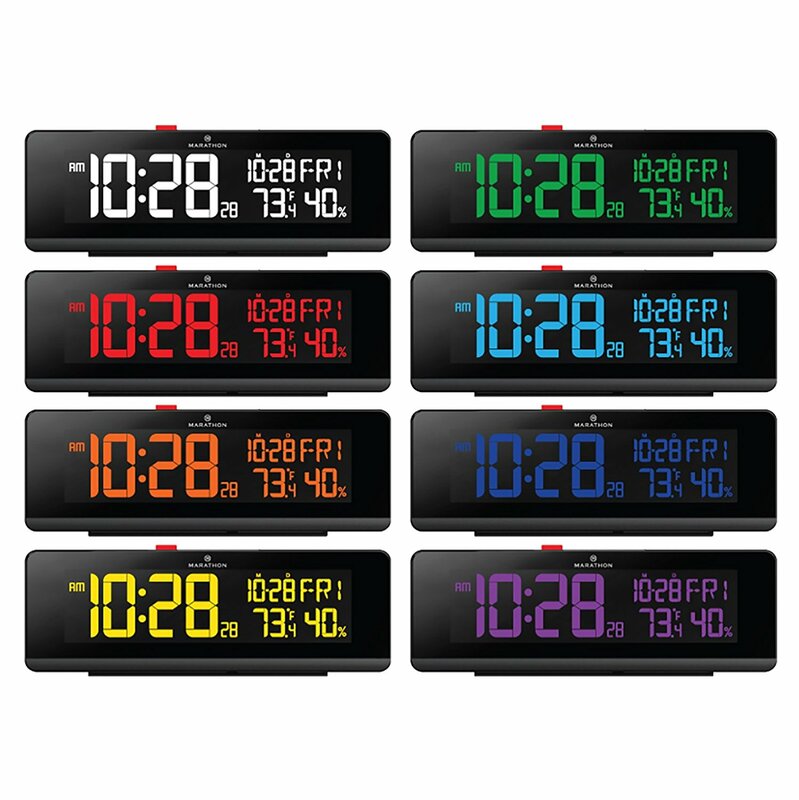 Our LCD Spectrum clock does just that by making telling time fun! By pressing the “manual” button we give you option of a time and date display in 8 different vibrant colors: white, red, orange, yellow, green, cyan, blue and purple. Can’t choose just one? We have a setting called “Demo Mode” that slowly cycles through a total of 256 colors. With lighting control, you can choose the maximum or minimum amount of light you wish your clock to display! 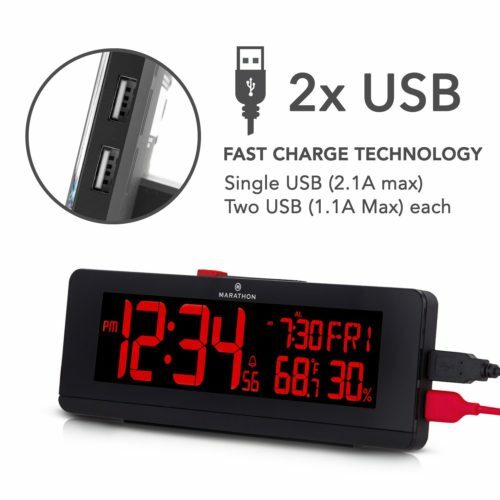 With 2 USB fast charging ports located on the side of the clock you can easily charge your or his/her phone or tablet while you work! Great for a multi-tasker. Another cool addition is the universal AC adapter. 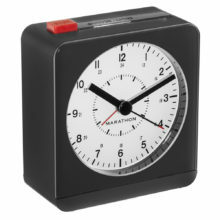 Measuring at 10x3x4 and weighing 1.35 pounds so you can take this clock ANYWHERE! 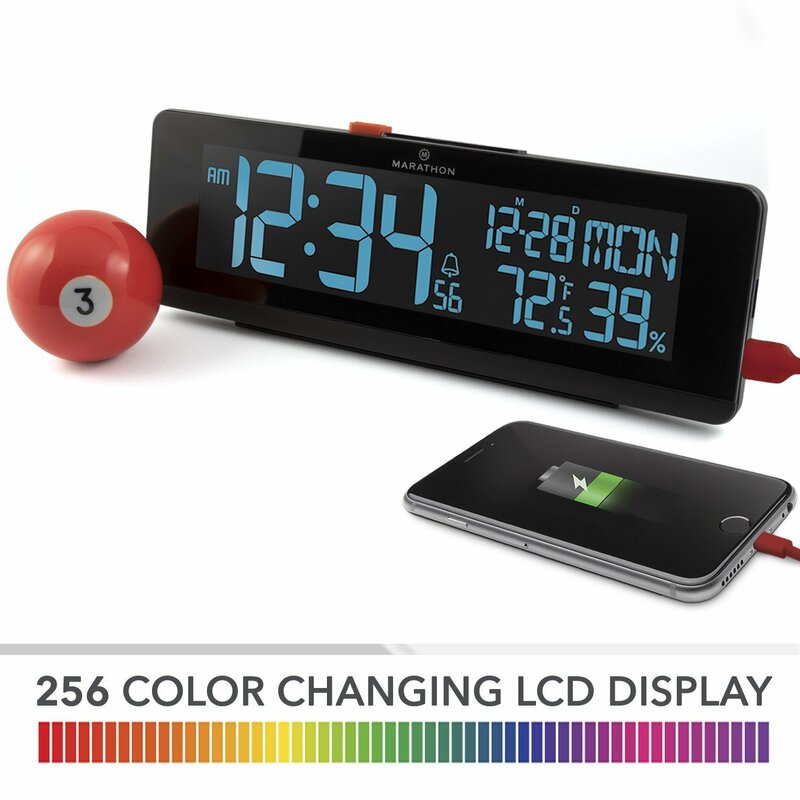 The COLOR ALARM CLOCK & USB CHARGING is probably one of the most useful and unique clocks you will see.